This is a review of HairMax Dietary Supplements. This is a supplement geared toward both men and women who suffer from weak, brittle hair. It claims to provide essential nutrients to strengthen hair and give healthy looking skin. Continue reading to see if this product is ideal for you. 17.5 mg Niacin to promote circulation to hair. 2,500 mcg Biotin to maintain the elasticity of the hair. Other ingredients include: gelatin, stearic acid, magnesium stearate, silica, milk, and soy. This means this supplement is not for those who are looking for a vegetarian/vegan option. It is also not meant for those who are allergic to soy or milk products/byproducts. The manufacturer recommends the consumer take 2 capsules daily. This supplement should only be consumed by healthy adults. There are currently no listed side effects found on the website. Though any supplement that causes an adverse reaction should be discontinued. The price for a 30 day supply of this product is $18.00. This is ideal for those who are looking for an affordable dietary supplement. However, as with all products, items that are listed at too low of price can raise concerns for the quality of the ingredients and whether or not it will provide results. The manufacturer provides a 20 week money back guarantee. So any consumer who is not happy with the results of this products can send it back within the 20 weeks for a full refund. While there are positive reviews on this website, it must be stated this product is used in conjunction with another product sold by the manufacturer. There are no reviews to affirm the results of this product without the accompaniment of the other. 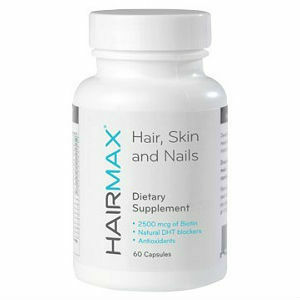 The manufacturer’s website is diligent to provide all the necessary information about the ingredients of HairMax Dietary Supplements . They also make sure to provide the customer the option of a 20 week money back guarantee. With the extensive list of ingredients, this is product can be used to promote and maintain a person’s overall health and not just their hair or skin. However, potential consumers may be deterred by the lack of reviews for the product found on the website. All the success stories and reviews written are for this product with the accompaniment of another. This is not ideal for consumers who wish to only purchase this product for their hair loss needs. Another factor that may cause this product to not be ideal for you is the fact it is not vegetarian. Finally, despite the fact there is a money back guarantee, the fact you are recommended to use this product in conjunction with another to see the results, may be the deciding factor. If you want results with just one item then this is not the right product for you. John Brownstone	reviewed HairMax	on July 28th	 and gave it a rating of 3.